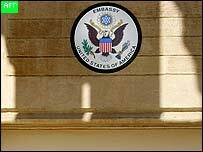 A mortar shell has hit the roof of the US embassy in Baghdad, lightly injuring two employees, an embassy spokesman has said. The spokesman said the building was hit between 1700-1730 (1300-1330 GMT). The roof was slightly damaged. 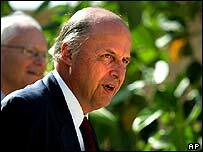 US Ambassador John Negroponte was not in Iraq at the time of the attack. The embassy in the high-security Green Zone which has often been the target of insurgents opposed to the US-led presence in Iraq. A grey plume of smoke could be seen rising from the building - one of Saddam Hussein's former palaces, the Associated Press news agency reported. "One member of the embassy staff was close enough to be shaken, his ears were ringing, but he didn't require medical treatment," the embassy spokesman said. "The other was injured and required some medical attention, but nothing serious." The US embassy in Baghdad will be the largest US mission in the world when fully completed - with a staff of 1,700, roughly 1,000 Americans and 700 Iraqis. The US-backed Iraqi interim government is also situated in the Green Zone. Insurgents launch almost daily mortar attacks at the area.